Working with CARE is one of the most enriching experiences of my professional life. Being a person of immense curiosity, this has turned my days at CARE into full days of immense learning. It is a professionally fulfilling experience. Both teams put women and girls at the centre of what they do, and it gives me great job satisfaction coming into work every day knowing that I am helping empower women and girls round the world to fulfil their potential. In addition to working within a great team, my role requires interaction with colleagues across CARE UK, giving me a greater insight into the workings of the organisation. I like the fact that CARE focuses on results – getting the work done. The management style lets me do my job. I also like the sense of family around my workplace. The people at CARE are positive, helpful, friendly and yet professional. 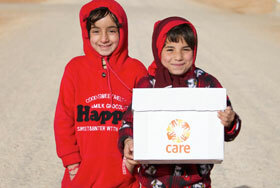 CARE is a lovely place to work with a real team atmosphere where everyone is doing their bit to help those in poverty or affected by emergency situations around the world. The decisions I make within the Direct Marketing team and the projects I’m responsible for make all the difference to the first impressions people have and the experience they end up getting, which is a huge, but exciting responsibility. “Fundraising can be a fast-moving and challenging beast in any organisation, but when there are a plethora of tangible results to show what your efforts have helped to achieve, it really is rewarding. I have an excellent team around me and I have fun everyday so that makes all the difference in keeping motivated and focused.